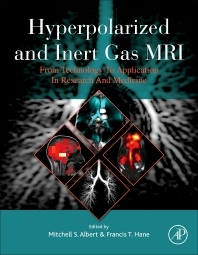 Hyperpolarized and Inert Gas MRI: Theory and Applications in Research and Medicine is the first comprehensive volume published on HP gas MRI. Since the 1990’s, when HP gas MRI was invented by Dr. Albert and his colleagues, the HP gas MRI field has grown dramatically. The technique has proven to be a useful tool for diagnosis, disease staging, and therapy evaluation for obstructive lung diseases, including asthma, chronic obstructive pulmonary disease (COPD), and cystic fibrosis. HP gas MRI has also been developed for functional imaging of the brain and is presently being developed for molecular imaging, including molecules associated with lung cancer, breast cancer, and Alzheimer’s disease. Taking into account the ongoing growth of this field and the potential for future clinical applications, the book pulls together the most relevant and cutting-edge research available in HP gas MRI into one resource. Dr Albert is the Lakehead University (LU)/Thunder Bay Regional Research Institute (TBRRI) Research Chair and Professor of Chemistry at LU. He co-invented the hyperpolarized (HP) gas MRI technology, and has been an ongoing pioneer in developing and applying HP gas MRI to new applications in research and preclinical settings. Dr Albert received a Ph.D. in Physical Chemistry from the University of Stony Brook, and served as a Professor at Harvard Medical School and the University of Massachusetts Medical School prior to joining the faculty at LU/TBRRI. Dr Albert has published over 100 peer-reviewed papers and holds a 1.0 field-weighted citation impact, an H-index of 18, and 15% of his work appears in the top 10% most cited journals worldwide. His collaboration is International with 47.4% of his work co-authored by researchers in other countries. He is a leader in next-generation outgrowths of HP gas MRI: HP xenon functional MRI (xenon fMRI), HP xenon biosensor MR molecular imaging, and fluorine-19 lung MRI of inert fluorinated gases. For his contributions to the field of HP gas MRI, Dr Albert received a Presidential Early Career Award for Scientists and Engineers from U.S. President William Clinton in 1998. Dr Hane is a post-doctoral fellow at TBRRI. He earned a Ph.D. in Biophysics from the University of Waterloo. He has contributed numerous conference talks and poster presentations. His doctoral work examined the role of metals and aggregation inhibitors on amyloid-ß, the protein implicated in Alzheimer’s disease. The discoveries are important in understanding the very initial stages of the Alzheimer’s disease cascade. Dr Hane has published 20 peer-reviewed papers and carries a 1.42 field-weighted citation impact, H-index of 5, with 30.8% of his work appearing in the top 10% most cited journals worldwide. 33.3% of his collaboration has been International, co-authored by researchers in other countries. Since completing his PhD, Dr Hane trained as a post-doctoral fellow under the supervision of Dr Albert. Dr Hane is presently working on developing new applications of HP gas MRI, including molecular imaging of amyloid oligomers for early detection or Alzheimer’s disease using HP xenon biosensor MRI, in collaboration with Dr Albert at TBRRI. Dr Hane is an expert on HP gas MRI molecular probes.